Artist: Jozza Title: Minnie Mouse Custom White Frame and Ready to Hang (frame included free) Framed Dimensions: 20" x 24" Canvas Dimensions: 15.5" x 19.5" Medium: Original Acrylic on Canvas Edition: Original One-of-a-Kind Hand Signed by the artist, Jozza (front and back) Excellent Condition Artist Biography: Jozza was born in 1958 in Hidrolandia, a small town located in central Brazil. Sometime after 1996, after moving to Miami, Jozza met Romero Britto while working at Pizza Via on Lincoln Rd. Next door to Romero Britto Gallery; Britto used to go there for lunch. One day Jozza and Britto started a conversation and found out they were both from Brazil. They spoke on many occasions when Britto would come to eat; Britto got to know quite a bit about Jozzas artistic abilities. During one of their conversations, Britto invited Jozza to come work with him. Jozza was very excited to have the privilege to work and learn with a master. He worked with Britto for two years, and he was the first and only Britto Student. He thanks Britto every day for all that he did for him during the two years he spent working with him; Britto is one of the nicest and most generous person he has ever met. In the year 2000 Jozza had his first exhibition, at Biscayne Tower I in downtown Miami, and he had a taste of what it was like to sell his first piece, and from that experience, he started to exhibit his artwork at different galleries. The first gallery who opened their doors for him was Gallery Art at Promenade Shop in Aventura Fl; they ended up representing him. Jozza knows definition of style takes a long time, there are thousands of good artists out there working for years and years that havent got there yet. Jozzas work is being shown worldwide; you can even find it in the Hollywood movie, Transporter II directed by Louis Leterrier. Jozza, along with Miami Dade County Public Schools established an educational project where the artist takes his artwork to the classrooms, This allows the students to participate directly in the painting. He does this as an attempt to teach art, and search for new talent. Jozza creates his vision with vibrant imagery and combinations of hard edged and abstract humans. His paintings are inspired by the simple streets of Brazil, all the way to the elegant Cities of the United States; cities full of rhythm, people, nightclubs, subways and restaurants where urban life subjects the spectrum of society class. The shimmering animated colors are captured in over 1,000 works around the world. Jozzas work is included in numerous public and private collections in United States, Brazil, Spain, and Germany. 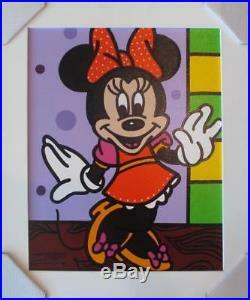 Minnie Mouse Original Custom Framed Acrylic on Canvas. Custom White Frame and Ready to Hang (frame included free). Framed Dimensions: 20" x 24" Canvas Dimensions: 15.5" x 19.5" Medium: Original Acrylic on Canvas. 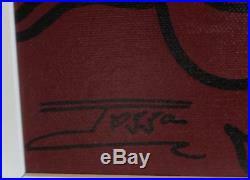 Hand Signed by the artist, Jozza (front and back). Jozza was born in 1958 in Hidrolandia, a small town located in central Brazil. All items are 100% guaranteed to be as described in the listing. As such, we cannot offer a return option on our merchandise simply because a customer changes his/her mind after opening up the artwork. Also, please keep in mind that there may be a slight variation in color from one computer monitor to another; we recommend looking at a few internet sights to see color variation if this is a major factor in your purchasing decision. Communication is essential before returning any item. We only ask that you retain all packing materials until the matter is completely resolved and may request photographs of the damages, if necessary. It is our goal to build a customer base where our clientele will come to us first before ordering elsewhere. View My About Me page. 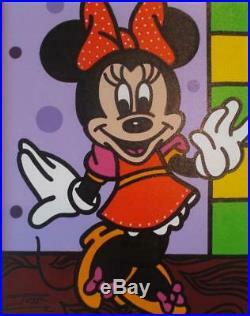 The item "Jozza Minnie Mouse Original Custom Framed Walt Disney Acrylic on Canvas Art" is in sale since Friday, April 5, 2019. This item is in the category "Art\Paintings". The seller is "dsunnylife" and is located in Boca Raton, Florida.